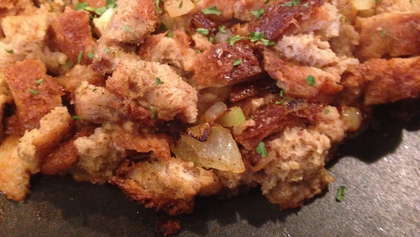 Simplicity goes a long way when it comes to stuffing. Impress your friends and family with this recipe! Saute onion and celery until tender and fragrant. Sprinkle veggies with 1/2 tsp poultry seasoning. Meanwhile, cut dried bread into 1" cubes. Toss bread into veggie mixture and stir to coat. Begin to add chicken stock, a little at a time, until desired consistency is met. Sprinkle stuffing with another 1/2 tsp. of poultry seasoning and season to taste. Sprinkle with dried parsley if desired. * You can dry bread slices in a 350-degree oven on a cookie sheet turning after a few minutes until bread is crunchy on both sides.